My wish list at Nordstrom seems to be growing everyday! There's so many cute things but do I really need any of it? Probably not! I will say I think i'm going to order this scarf! It's under $50 & looks soo cozy! 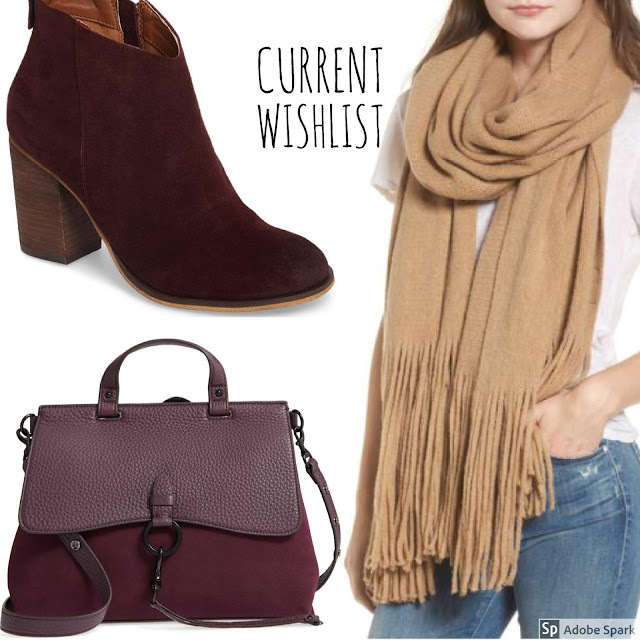 This bag is super similar to two I own so I don't really need it unfortunately- but if you don't have a bag in this wine shade you should get this one! Rebecca Minkoff handbags are such great quality for the price. * As some of you may have noticed I did a little blog redesign! Which took waaaay longer than I had anticipated. The whole coding and HTML behind websites is super complicated. I got so frustrated trying to use photoshop to create a new banner Kyle ended up doing it for me! But I'm happy to say that I really like how it turned out! * Baked some acorn squash! This is a great side dish for fall time! You cut the squash in half and place it in a baking dish with a little water in the oven for about 35 mins at 375- then you take it out- flip it over and add butter & brown sugar then bake a little while longer- It's so delicious! I had mine with ham, green beans & fresh biscuits! *Tried to really relax & unwind at night- This is so important to do. The last few weeks have been so busy for me I was starting to get burnt out. I've been taking the time each night to turn off my phone- make some tea and just relax, it has been so good for me! * Apple picking with friends! Every year Kyle & I go apple picking with my best friend Molly & her boyfriend- it's become quite the tradition so we're going on Saturday! * Heading to the middle of nowhere Vermont- Kyle insists that the best foliage is far away so he has requested we take a long drive- I can't complain though- pretty views & hot coffee isn't a bad way to spend a day. *Baking something! I think I might make some bread- Have you ever used a bread maker?? Life changing! There's nothing better than a loaf of bread you made! I love that wine colored bag!! So chic. I don't have much planned for the weekend besides working on the blog! The banner you have now is so cute! I love the whole design of your blog. I've been trying to make a conscious effort to get off my phone as well; there are so many other more relaxing things I could be doing! i'm just hanging out with my husband and hopefully going surfing and eating some good food this weekend! I love this scarf! Thanks! We're going to get sushi and see a movie this weekend. Much needed because I've been stuck inside all week due to surgery. That bag is stunning! I need it this fall. Please put those booties in my closet. They're amazing! I'm so jealous that you're going apple picking. I was telling my boyfriend that I've never been to an apple orchard before. He's from up north, and I've lived most of my life down south. I hope y'all have an amazing time! Love this! I also redesigned my Blog and I love the fresh feel. Hope you enjoyed all your weekend activities! Have those booties on my wish list, but they were sold out in my size! Ohhh that scarf looks so cozy! I really need to try to rest and unwind at night. It is so important! I so love the redesign - the new design is very you!